One of the challenges to improving your Emotional Intelligence (EQ) is that you need to unlearn some habits and beliefs that you’ve had since you were a young child. Only then will you be able to learn behaviours that are commensurate with high EQ. ‘Stick to the facts, leave the feelings out of this’. ‘If you don’t give as good as you get, you’re weak’. ‘Don’t beat around the bush’. ‘There can only be one winner’. While these phrases are all well-intentioned and have validity in certain circumstances, we can tend to overplay them. They can easily foster simplistic black-and-white responses and behaviours, whereas most important conversations and situations in workplaces are NOT black-and-white. We would be better served by adapting our language or behaviour to take account of the other person’s likely response or reaction. The purpose of communication is to gain a desirable outcome. Sometimes the outcomes we get are far from desirable because of our lack of management of our emotions and our lack of regard for the other person’s emotions. Was your purpose in those situations to annoy someone, to send them away or did you actually hope to influence them, to persuade them to do something you wanted? So you need to UNLEARN some of these old habits and beliefs, to admit that they while they have served you well, and continue to do so in some situations, it is not a ‘one size fits all’. If you want to influence people and to have a positive impact on results then you need to be mindful of other people’s emotions and of your own emotions. You must ensure that your behaviour is appropriate for managing the emotions and relationships to gain the best possible outcome, an outcome that is genuinely a win-win. This win-win outcome will be good for you personally, satisfying for the other stakeholders too and ultimately a great decision for business. People buy from people they know, like and trust. Why would they like or trust someone they feel puts them down, doesn’t listen to their view, negates or trivialises their feelings? If you want to get the outcomes you want then you need to be good at including people, both their ideas and their feelings. While this is conceptually easy, it is difficult in practice because of those old beliefs we have. When you let go or unlearn some of the old beliefs you can replace them with new beliefs, which will enable you to improve your EQ and your performance, your level of stress, your likeability and your chance of being noticed for the right reasons! What are some of the phrases and beliefs you grew up with? How do these impact the way you relate to, and work with, people? 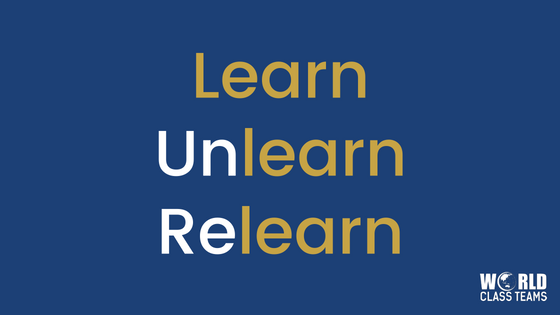 What do you need to unlearn so that you can then learn a better way to gain the best outcomes in difficult situations with difficult people? If this article resonates with you, and you would like to know more about how you can increase the EMOTIONAL INTELLIGENCE of your people, please call Ramsina McCully on 1300 085 248 or email ramsina@worldclassteams.com.au.